By now most of you who have read any of my 1,111 posts know of my starry-eyed glazed look when it comes to Safeco Field in Seattle. It is one of my favorite all-time Major League Baseball fields. From the pure excitement of the breath-taking sight lines just beyond the top tier of the Leftfield bleachers that look out into this great city from the lifeline of the elevated Alaskan Way, to the pristine waves and vessels moving about on Puget Sound, outside of Tampa Bay, this is my paradise lost. Anytime anyone, even the local media bloodhounds bring up the idea or issues concerning a possible new stadium for the Tampa Bay Rays, visions of Safeco go dancing around my head. With its massive roof mechanism and wheels that churn and burn to open and close their massive roof, to the amenities aimed at the fan’s enjoyment of the ballpark, Safeco is the model I conjure up as a foundation for any future Rays stadium plans. Sorry but the sail idea has left for a port of call somewhere else…possible Japan. Everywhere within this stadium is a swirling dervish of beauty. 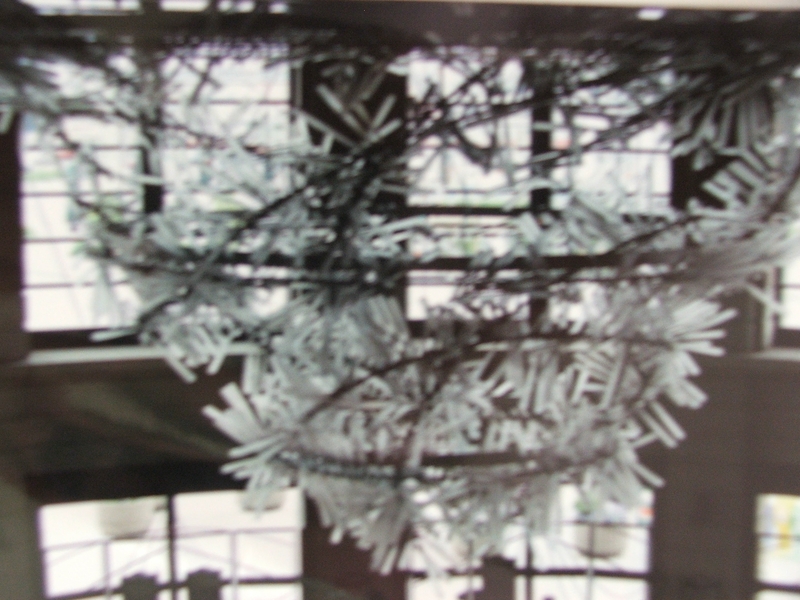 From the “Bat in Motion” sculpture above your head as you transcend into the ballpark, to the imprint of signed baseball from the Mariner’s team permanently placed within the points of the marble compass in the floor, Safeco was built for visitor’s and locals alike to gawk and remember forever. 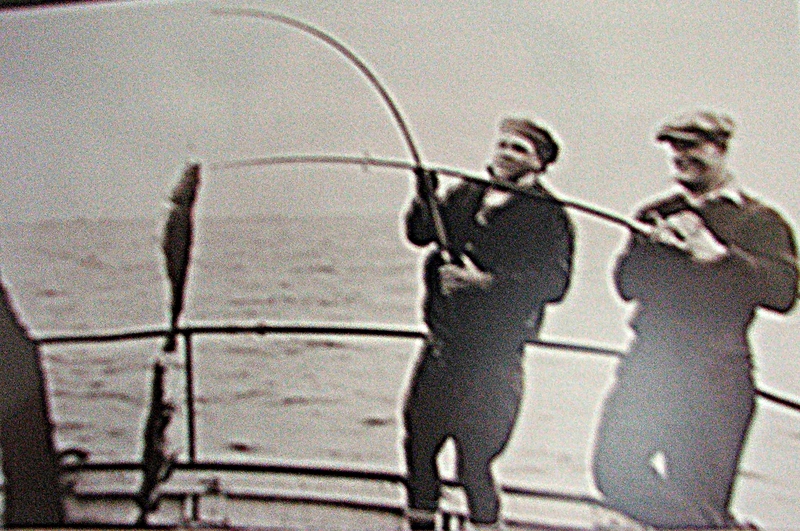 Within the hallowed walls of the exclusive Diamond Club sits a classic photo of Yankee greats Lou Gehrig and Babe Ruth poised at the back of a fishing boat just beyond the shores of Pass-a-Grille, Florida. It is one of the only photos of the two legendary stars off the field, even though they both lived in the penthouse apartments at the Ponce de Leon Hotel on Central and First Street just to the West of the old Waterfront Ballpark. Funny how a small sliver of Tampa Bay slipped into the magnificent Pacific Northwest achievement. From a concourse that runs a full 360 degrees around the stadium, that always gives guests a clear visual sight lines to the playing field to witness a play unfold while standing in line for Rally Fries or a cold Red Hook. I often daydream that this should have been the stadium style originally set upon the tract of land at 16th Street and First Avenue South in St. Petersburg, Florida, but the Tampa Bay community leaders called for a futuristic and modernistic ballpark. 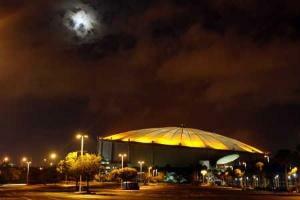 Rays Manager Joe Maddon recently cited during his banter about the Rays needing a new abode/stadium that it should feature a roof system that could be opened on sunny Florida days and evenings, and provide possible shade or comfort from the Sun and elements for a baseball complex or park just beyond the ballpark walls. 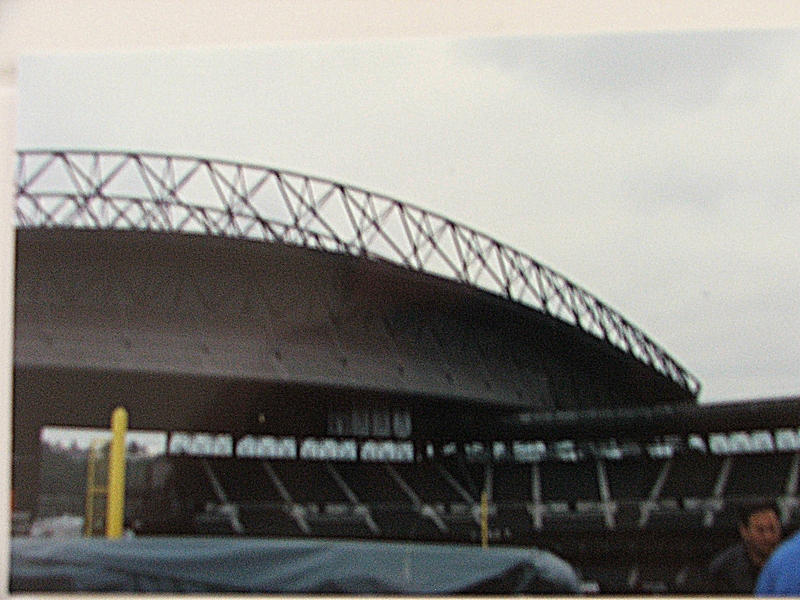 Seattle has that feature, but it is not a park that is covered when the roof is open, it is the staff and player’s parking area. But I like Maddon’s thought process here. 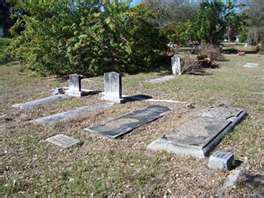 It shows again how someone within the Rays organization might have the same affection for this ballpark style that I do. Even in the crowded SoDo neighborhood where Safeco Field is located, sometimes parking is a premium. But the Mariners helped relieve this burden by building a 6-story parking facility just to the South of Safeco, which also has its own pedestrian bridge to stadium gates. 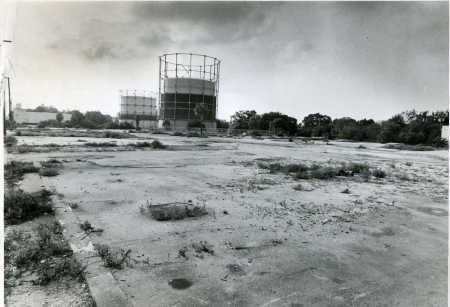 Did you know original drawings for Tropicana field also had 2-3 story parking garages to help eliminate parking hassles. 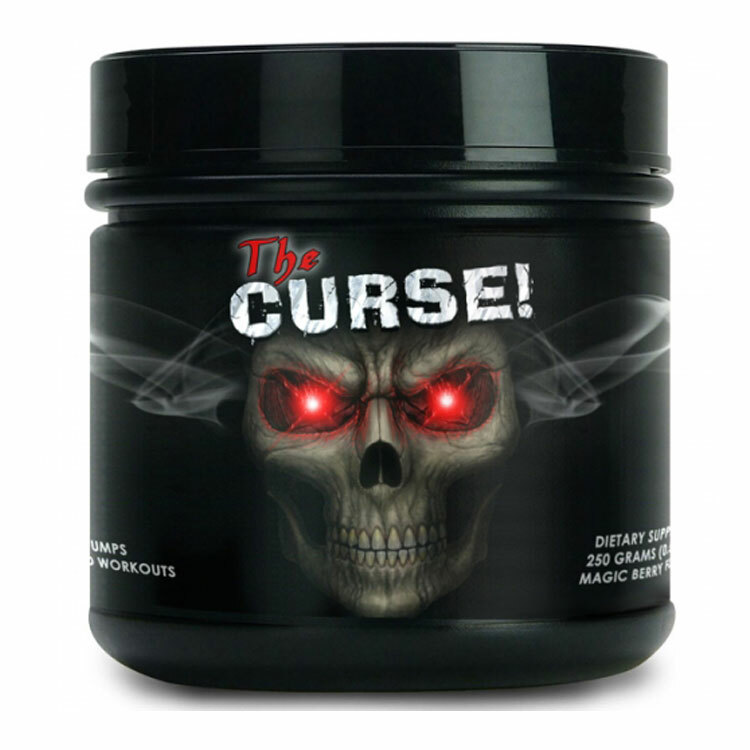 Wonder when and where that idea got flushed out into the bay? If the Rays truly want a 1-stop shop of stadium ideas and great features to incorporate into their future plans, Safeco has 60 % of their “wish list”. From the ample suites that ring the upper core of the stadium, to the old time ballpark feel of the Press Box area complete with roll-up windows, This stadium has something for everyone. 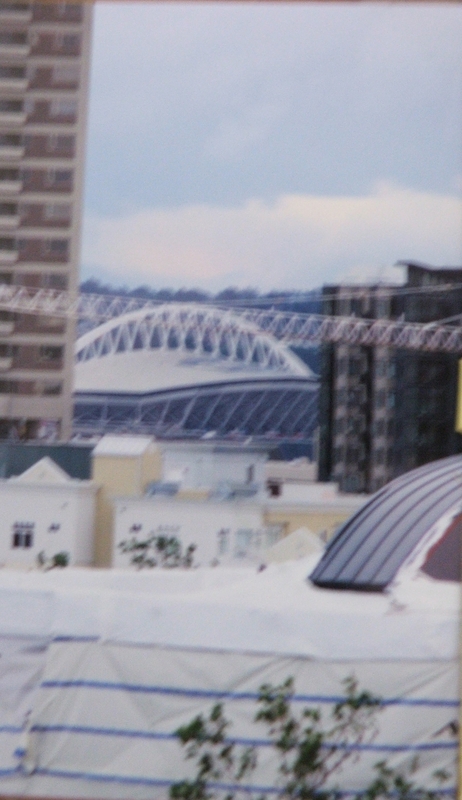 Ironically, the Mariners played in a dome a bit similar to the Trop a long time ago, and I still at times go and check out the video of the Kingdome’s final implosion. I still think in the deep recesses of my soul if the Tampa Bay community did not act with premeditation and “build it and they will come” mentality, this stadium design might sit in front of us nightly for Rays games. 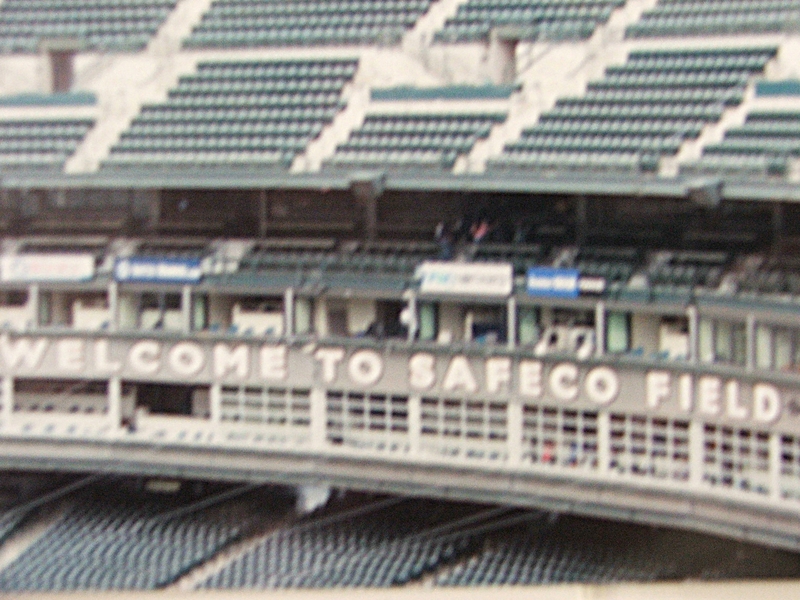 Everything about Safeco could be retrofitted or designed to conform with the Florida’s fickle weather. Humor me here for a moment and day dream on how he National media would not be calling out the catwalks, giggling about lamps busted by foul balls, or Bullpens in the field of play. Safeco somehow magically has taken the Trop’s visual faults and made them simply mute for the media fodder. Only thing the media can complain about is if they jaywalk on their way out of the building. Seattle doesn’t take kindly to jaywalkers. Just ask Chicago White Sox GN Ken Williams. 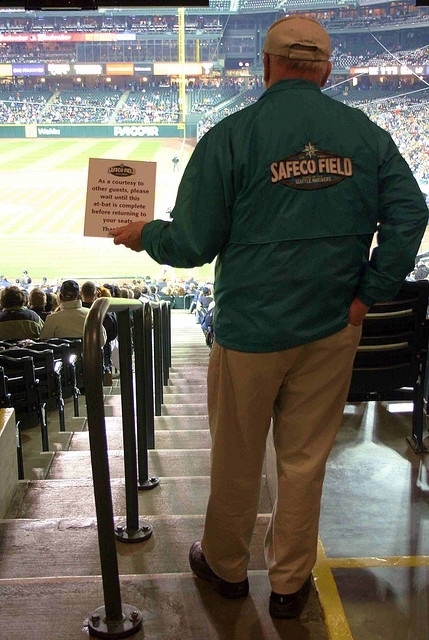 Even with the Rays Fan Host doing a superior job compared to so many other MLB ballparks, Safeco’s ushers do something I truly find remarkable, and warranted for fan enjoyment. When a hitter plants his toes in the batter’s box, the ushers in unison hoist up a placard prohibiting the disturbance of the fans by walking in the aisles. 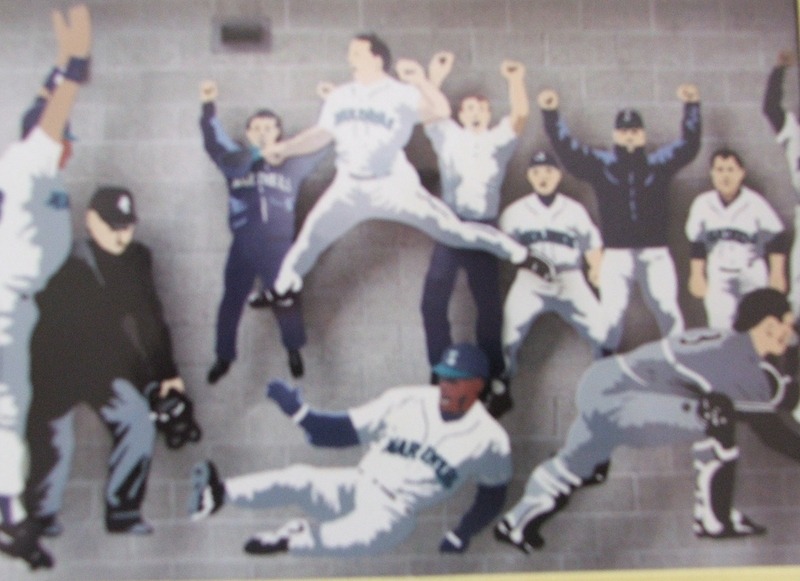 At Safeco, you are not allowed to walk up or down the aisle to or from the concourse while a hitter is in the box. Brings about a different take knowing Joe Schmoe is not going to walk in front of you with his nachos or beers and you miss a swing, a hit or possibly a historic moment. Instead you have to stand at the top of the aisle with the rest of the Safeco faithful hoping for a quick at bat, pop-up or 6-4-3 double play. The modernistic stadium design and motif of the Trop never caught on after Major League Baseball went suddenly into a revival of traditional ballpark styles right after the completion of the Florida Suncoast Dome The wide-eyed vision of a modern design ballpark fell sudden to a untimely and painful death. Safeco Field should be a constant reminder that local styles, influences and weather conditions can produce a stellar ballpark that even 25 years later people walk in a gawk at the visual eye-candy. I miss Safeco some times, especially since I truly feel that if it was built in 1991 or beyond, I would have been sitting in its majestic splendor for the last 14 seasons. Hopefully the Rays front office will take hundreds of photos of this landmark ballpark, make inquires into its design cost and realistic structural possibilities within the scope of the harsh Florida Sun and weather. Possibly one day we could see a future Tampa Bay ballpark being built with the similar fan-friendly quality’s and retracting roof of this exciting park nestled some 3,125 miles to our Northwest. Or maybe I am still daydreaming.